You have picked your baggage and left the airport or railway station. What's next? Students should read it! If you are a student: go to your University.You have to visit a International Relations Office. Give them your passport with visa and a migration card (they will give you a special temporary form, where should be written that your documents are at the university). You have to make it ASAP, because they have only 7 days for making a registration for you, otherwise you have to pay a penalty duty. Usually foreign citizens give their documents for entering the University in the same place - in International Relations Office. They may redirect you to your faculty, or directly to the student hostel. International Relations Office workers are your helpers in settling in Russia. You probably would e asked to purchase a special student policy and visit a doctor. 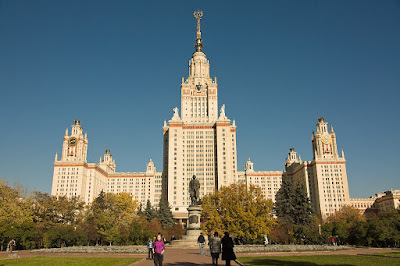 Also, if you have enrolled on a full scholarship, you have to issue a Russian bank (usually Sberbank) card and tell the card requisites to International Relations Office. Your grant will be transferred to your bank account. As we remember, you gave your passport with visa and migration card to International Relations Office worker, so they could make you a registration in Federal Migration Service. 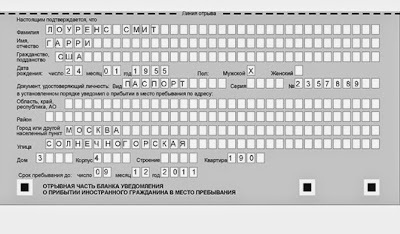 The procedure of the migration registration implies informing (notifying) a relevant territorial office of the Federal Migration Service of a foreign citizen's arrival to the place of sojourn and must be carried out in the course of seven working days after his or her arrival to the Russian Federation. One should know that all migration registration procedures are carried out by the Host Party, the foreign citizen him/herself is not required to address any organizations wasting his/her time. This is a form of notification of the foreign citizen's arrival at the place of sojourn, very important thing. You can read about it on the Migration Service webpage. There are some information about you: your name and surname, citizenship, birthdate, passport, visa and migration card ID, address of your hostel etc. Police officers can ask you to show them this form. You have to carry it with your passport and migration card anywhere you'll go. There's one more important thing that you have to do - visa prolongation. Read about it in that article.